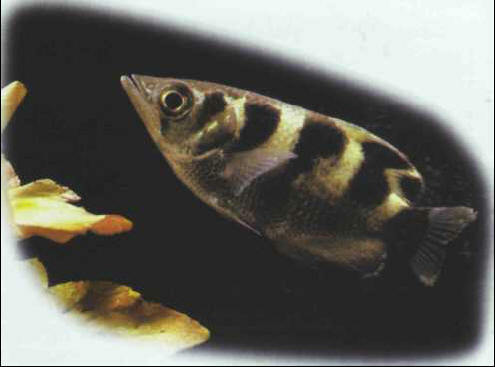 The archer fish has its "hunting ground" just below the surface. To capture small insects for food, it shoots out a powerful jet of water, knocking down the prey, which it then snatches with its mouth. Its precisely aimed "shot" is made possible by excellent vision through both water and air; the jet can hit a target up to 1 m away. A territorial species, sometimes aggressive, and requiring hard, brackish water. Not known to breed in captivity. Food consists chiefly of living prey: preferably insects, otherwise tubifex or the fry of Poeciliidae. Size: 15 cm. АНКИЛОСТОМОЗ , инвазионная болезнь собак, песцов и лисиц, вызываемая нематодами - анкилостомидами, паразитирующими в тонких кишках. Симптомы: рвота, понос.